The class level members which have static keyword in their definition are called static members. All static members are identified and get memory location at the time of class loading by default by JVM in Method area. Only static variables get memory location, methods will not have separate memory location like variables. Static Methods are just identified and can be accessed directly without object creation. A class level variable which has static keyword in its creation statement is called static variable. We can not declare local variables as static it leads to compile time error "illegal start of expression". Because being static variable it must get memory at the time of class loading, which is not possible to provide memory to local variable at the time of class loading. All static variables are executed by JVM in the order of they defined from top to bottom. 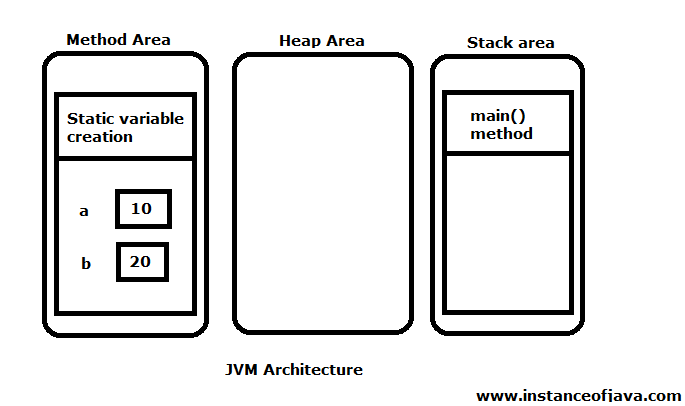 JVM provides individual memory location to each static variable in method area only once in a class life time. Static variable get life as soon as class is loaded into JVM and is available till class is removed from JVM or JVM is shutdown. And its scope is class scope means it is accessible throughout the class. If multiple variables are created with same name are considered as duplicate variables. In the same scope we can not create multiple variables with same name. If we create it leads to compile time error "variable is already defined". Even if we change data type or modifier or its assigned value we can not create another variable with same name. But it is possible to create multiple variables with same name in different scopes. // it is allowed to define "a" in this method. It is possible to create local variables or parameters with same variable name. The concept is called shadowing . It means local variable is a shadow of class level variable. It means when you access it in side method , you will get local variables value but not from class level. When we call a variable compiler and JVM will search for its definition in that method first, if its definition is not found in that method then will search for its definition at class level. If its definition not found at class level also then compiler throws error: can not find symbol. This phenomenon is called local preference. By using class name we can get class level variables value. First all static variables are executed in the order they defined from top to bottom then main method is executed. Final static variables are constants. Declaration itself we need to assign value to the final static variables otherwise compiler error will come: "The blank final field may not have been initialized". And we can not change this value if we try then compiler error will come: The final field cannot be assigned.